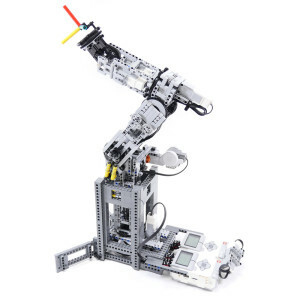 6-Axis Robot Arm (Type: V760) using Lego Mindstorms EV3. V760 is an improved model of the 5-Axis Robot Arm (S750) using NXT. The degree of freedom of S750 was five, so that the hand posture of S750 at an arbitrary position was restricted. The degree of freedom V760 is improved to be six, so the hand of V760 can move to an arbitrary position with any posture. 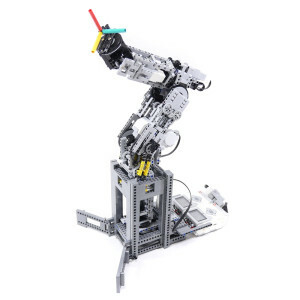 The structure of the joints of V760 is the same as a general industrial 6-axis vertical articulated robot. I aimed to make the shape of the robot slim. 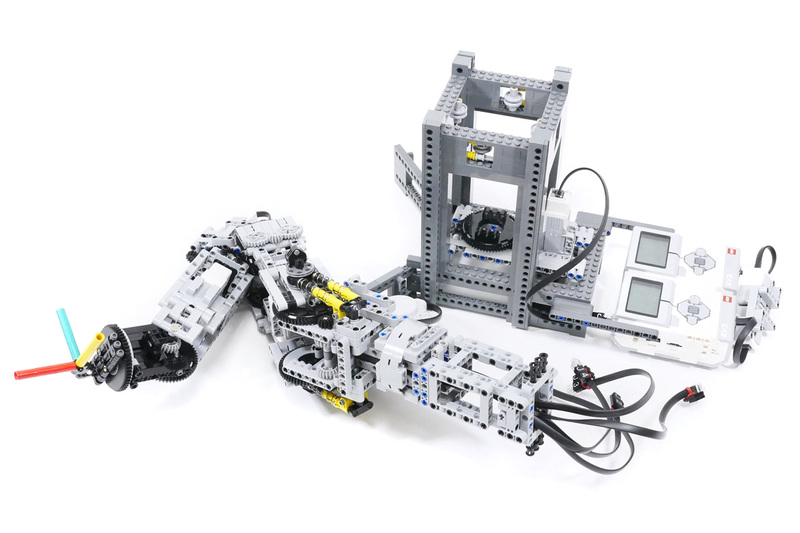 The robot V760 is easy to build in a smaller size because new Lego parts such as medium-sized servo motors and 60-tooth turntables are available. The spring balancer is used only at the second joint that is subjected to the heavy duty. I always try to build my Lego models only using genuine Lego parts, but for V760 I used long cables (70 and 90 cm) made by HiTechnic Co., Ltd. because a genuine Lego cable (50 cm) is too short to connect. I had difficulty in making the turning bearing of V760. It is subjected to large bending moment when the arm takes a horizontal posture. It is difficult to bear the moment only by a single turntable part. In order to solve the problem, I added a bearing that is consist of 4X4 size macaroni parts and roller parts in addition to a regular bearing made from a turntable part. A pair of bearings disperse the stress caused by bending moment. The structure achieves both of the strength against large moment and the slim shape of the hip of the robot. 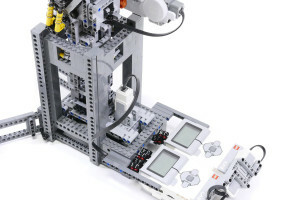 The programs executed in EV3 bricks are written in C using TOPPERS/EV3RT. Though I wanted to use USB or Bluetooth for the communication between two EV3 bricks, the communication has not been achieved yet. I temporary used two light sensors to enable two EV3 bricks to communicate with each other by synchronizing signal. The EV3 bricks calculate the inverse kinematics of the robot in real time and solve the angle of the each joint from the target position and posture of the hand. In the demo video, the movement from a start position to a target position is calculated in different two modes. In the linear interpolation mode, the movement of the hand draws a linear locus. In the joint interpolation mode, the movement of the hand does not draw a linear locus. Not EV3 L-motor but NXT motor is used for rotating the second joint because the inner gear backlash of NXT motor is smaller than that of EV3 L-motor. I am planning to attach a chuck at the tip of the robot and the robot can be used for material handling.